"During the late summer of 2007, Doug was the top-rated, political talk radio show host in his market, on Saturday mornings. His show advocated true freedom, and he regularly ripped into politicians, exposing corruption and abuses of power. In addition to his loyal, local, terrestrial radio audience, he received supportive phone calls from listeners across the USA, and from listeners as far away as The Netherlands, who listened to the live feed of the show over the Internet. While searching the Web for others in his local area that held similar political views, Doug discovered Eric Fleming. At the time, Eric was playing guitar in a very popular, local Metal band. After finding common ground in politics and similar writing styles with heavy, powerful music—and inviting Eric's band to be guests on the radio show—Doug asked Eric if he would be interested in playing guitar on a solo project that he was putting together. Eric agreed, and the two began working on material that Doug had previously written. Before long, it became obvious that Eric’s band situation wasn’t working out as he had hoped, so Doug and Eric decided to turn the solo project into a collaborative effort. The two became great friends and business partners. For the next several months, Doug and Eric put considerable time and effort into writing and recording material at Six+1 Studios, in Florence, South Carolina. The result of those recording sessions became the band's debut album, "SOUNDTRACK OF THE REVOLUTION." Wanting to take their music to the masses, Doug recruited one of his long-time friends, Will Wiggins, to join them on bass guitar, and Eric brought in one of his friends, Marlon Slater, to join them on drums. Once the lineup was finalized, things began to fall into place very quickly. 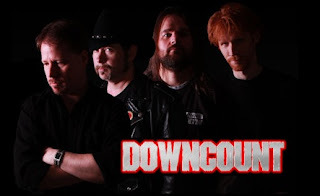 Now, DOWNCOUNT are unleashing their empowering music and message, providing the soundtrack for the new revolution and those who understand that something is very wrong with our world. The band’s sound is a mixture of many hard rock & Metal influences, combining thick, chugging guitars; solid, grooving drums; rumbling bass; and powerful, yet melodic, vocal lines."